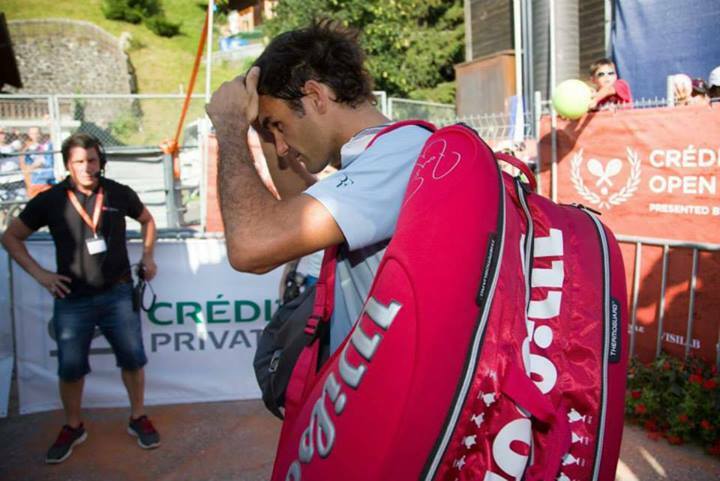 Daniel Brands upset top seeded Roger Federer Thursday in Gstaad, at the 2013 Credit Agricole Suisse Open. The Swiss maestro was erratic at times, against the same opponent in the same round just a week ago in Hamburg. The big serving German broke for 4-2 in the first set, saving two break points before taking a 5-2 lead and serving out the set moments later. Robbing Federer of any chance to turn around the match, Brands broke immediately in the first game, and it would be enough to go on to end the Swiss star’s appearance at the tournament where he made his debut 15 years ago. While he came off a close loss in Hamburg and had issues flare up with his back earlier that week, he remained committed to playing in Gstaad. FedererFan07.com sources tell that Federer would have chosen not to play this week, but only did so under his word and being in Switzerland. “In the last 7-10 days I could hardly practice. This made it difficult to prepare properly. I decided to play so it’s no excuse,” said Federer. Next for Federer is the North American hard court swing, starting with the Montreal masters, beginning August 5. By the US Open, he will decide on his racquet going forward. Following the Rogers Cup in Montreal is the W&S Open in Cincinnati.